The ZOLLER »smile« is the universal presetter and measuring machine that offers you really great technology in a small vertical format and at a surprisingly low price. for machining centres, transfer machines, boring machines, CNC-controlled lathes as well as for grinding and sharpening operations for measuring grinding wheel packets and tools. Depending on the tool length, it's available in five different ranges of measurement and is equipped with the innovative »pilot 2.0« or »pilot 3.0« control software, guaranteeing you the highest level of measuring technology. Thanks to its low acquisition costs, the ZOLLER »smile« is ideal for companies with small to medium batch sizes and low levels of tool changing per shift. 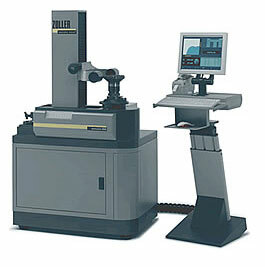 The measuring slide moves manually, while all tool parameters such as length, diameter, radius etc. are already measured automatically. Universal setting and measuring device for the contactless measuring and adjustment of all kinds of tools. Equipped with the “C.R.I.S” function, a measuring program for the precise measurement of radii in spiral tools such as full radius milling cutters, cutter heads, grinding wheel sets, form cutters, etc.